A Moon Winx postcard from the 1930s. The Moon Winx Court was built in the 1920s about four and a half miles outside of Tuscaloosa proper on the Birmingham Highway (US 11) which today is University Boulevard in Alberta City neighborhood of the city. 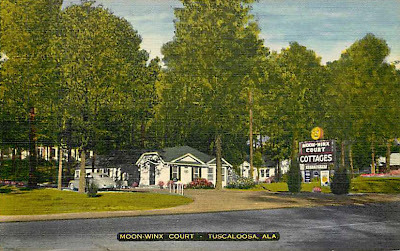 Originally owned by Meade Johnston, the motor court-style motel was a landmark for out-of-town visitors in the 1920s and 1930s. Its 20 rooms could accommodate a total of 56 guests. During its initial heyday the motel hosted celebrities such as St. Louis Cardinals' owner Sam Breadon, women's golfer Louise Suggs, singer Helen Jepson and famed explorer Dr. R. Chapman Andrews. It was also a regular stop for fans and officials accompanying teams playing the University of Alabama squads. Eddie Jacquin, a sportswriter with the Champaign, Ill. News-Gazette, who traveled extensively in the south covering University of Illinois baseball during the 20's, wrote of the Moon Winx: "Tuscaloosa also goes down in our notebook of travels as having on its outskirts the finest motor court we have ever seen. It is called Moon Winx and nobody knows just why except that in Alabama on a certain night the moon winks! So there you are." In 1946, Johnson retired to the Gulf Coast and sold the Moon Winx to Holt native Victor Rogers. During Rogers' tenure as owner the motel it was considered one of the most respectable lodgings for visitors in the area. Visiting luminaries such as actors Robert Mitchum and Allan "Rocky" Lane stayed at the motel in this period. News after the 1954 renovation. 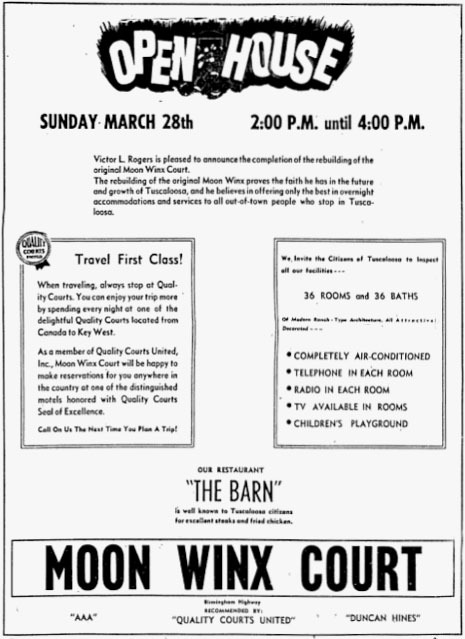 It was during the 1940s that the Moon Winx became part of Quality Courts – a referral group that formed in the late 1930s to control the growing negative perception the public had of motels. Rogers' daughter, Susan Elmore, recalled in 2003 that vehicles with local license plates were required to have a very good reason to stay. 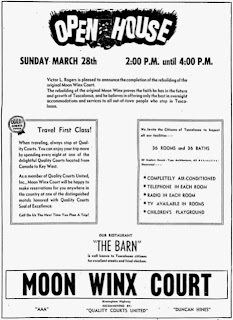 In 1950 the Moon Winx was expanded with the construction of a new building that boasted 12 air-conditioned rooms - increasing the motel's capacity by half. 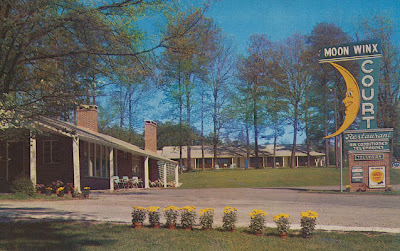 Four years later Rogers completed a renovation of the entire motel that included upgrading all the rooms with air-conditioning, television and telephones. A restaurant, The Barn, was added during that period which was renowned for its home cooking. The restaurant became one of The Lamplighter chain in 1960. Rogers sold the hotel in 1956 when he learned that traffic on the highway was to be routed to Skyland Boulevard. It would be the construction of Interstate 20 between Tuscaloosa and Birmingham during the 1960s that would lead to the decline of the motel. But two notable events occurred before that time which elevated the Moon Winx to a Tuscaloosa institution. In 1959, artist Glenn House with the River Sign Company made a half moon sign for the motel using dayglo paint. The lettering and moon were outlined in neon lighting. The eye catching design has become indelibly associated with the business if not Tuscaloosa itself. A year prior, Paul W. Bryant returned to take over the Crimson Tide football team and he began the practice of housing the squad at the Moon Winx the night before home games. The team would have their pre-game meal in a partitioned-off section of the motel dining room where Bryant would give his charges a final speech before heading to the stadium. A Moon Winx postcard from the 1960s. "A Visitor's View Of Our Town," The Tuscaloosa News, Sunday, April 9, 1950, p 4.